Arriving illegally in France in 2013, Francis Ngannou today goes head-to-head with the greatest fighters of MMA, a discipline combining the techniques of judo, karate, jiu-jitsu and Thai boxing. The 32-year-old Cameroonian now earns his living from the sport in Las Vegas. InfoMigrants retraces the path that took the champion from sleeping in a Parisian parking lot to his extraordinary destiny. "My father, 'this guy' who never did anything for us"
"I always knew that one day I would be a great boxer," Francis Ngannou says. Considering his size, no one would doubt that statement. He is nearly 6-foot-8 tall and weighs 260 pounds. His name might not ring any bells, but in just a few years Francis Ngannou has become recognized in his discipline MMA (mixed martial arts) - a combat sport that combines jiu-jitsu, karate, judo and Thai boxing. Ranked fourth in the world, the "Predator," as he calls himself, is currently in Paris training for his next fight, which will be held in China on November 24. The event will be of historic proportions; though it is still little-known in France, MMA is hugely popular in the United States, and fights are aired on television and watched by millions of viewers. It's no wonder then that his lifestyle is one of luxury, starting with the house he owns in Las Vegas. Today, Ngannou is all bling, sporting a gold watch, light pink loafers that match his sweater and a fancy Canadian down parka. His life has radically changed. It was a meteoric rise for a man who arrived in Paris one Sunday in the summer of 2013 without papers - and without money. Like thousands of other migrants, Ngannou experienced the nightmare of life on the street. "Everything happened very fast," he repeats several times, sitting in a restaurant in the 12th arrondissement of the French capital, where he currently follows his daily routine. "From the moment I started fighting, my career took off," he says. Ngannou's life is an unlikely success story. Born in Cameroon in 1986, the boxer had a difficult childhood. The second child in a family of five, he was shifted from house to house after his parents divorced when he was only six years old. "I changed schools all the time, and sometimes even transferred in the middle of the year because I went to stay with a different uncle," he says. At the age of 10, Ngannou began working on his first "little job." It wasn't the easiest one either: he worked in a sand quarry in his native village, Batié, in the Cameroonian highlands, to be able to pay for his schooling. It was an exhausting job for a child. 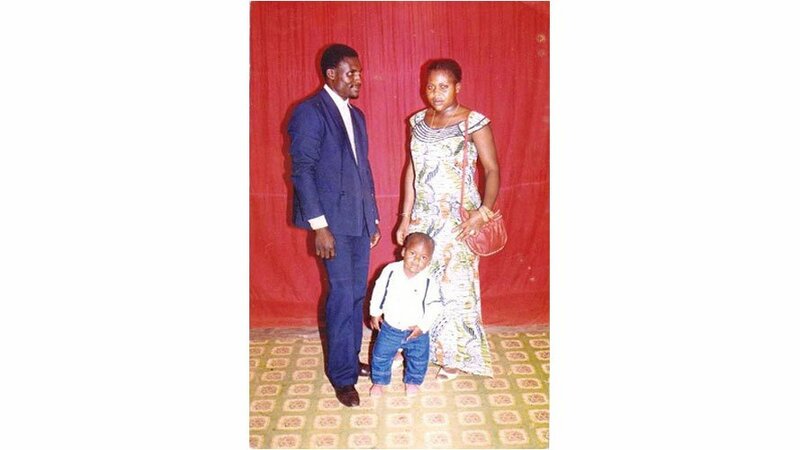 A few years later, Ngannou moved to Douala and, at the age of 22, began boxing at a small club in the city. "I don’t really know why," he says, "The sport isn't even known in Cameroon." But before long, he sold everything he owned to support and follow his new passion. The young man sacrificed his motorcycle to buy his first set of sport equipment. "Everybody told me I was crazy. It was a delusion to my family," he says in a soft voice that contrasts with his stature. Boxing became an outlet for Ngannou - a place to channel his energy. "My father was a violent man. He often hit us, my mother, my brothers and sister and me. When I was goofing around with my friends, people said about me: 'He is violent like his father.' I quickly realized one thing: I did not want to become like him," he says. "My father, 'this guy' who never did anything for us, at the end of the day was a role model for me. I understood through him what I didn't want to be. It's crazy how life works." At the age of 25, Ngannou found out that he had Hepatitis B. With no money to pay for drugs, he returned to his village for treatment. He put boxing aside and started raising pigs. "Then I realized that I had to leave if I wanted to continue boxing and become a champion," he says. Without telling his family, the Cameroonian young man set out on the path of migration one day in 2012, with his only luggage a small backpack. "The barbed wire of Melilla, I will never forget"
"If my 18-year-old brother wanted to go to Europe, I would tell him not to. I know all too well the risks that are involved," he says. Asked many times by the media, Ngannou always refused to talk to the press about his experiences as a migrant. They were too painful and too recent. He says he preferred to forget, to erase those long months spent on the road from his memory. He crossed Niger and Algeria before arriving in Morocco. 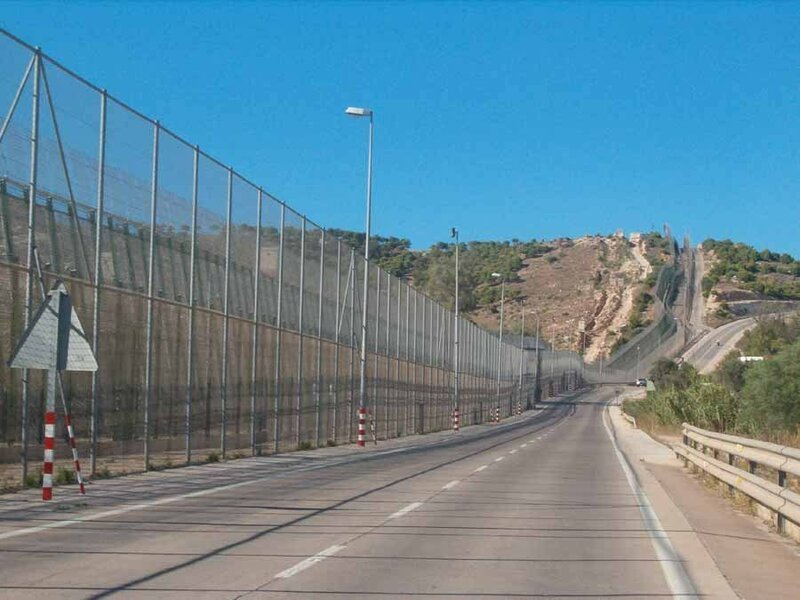 It was a terrible ordeal for him: "The barbed wire of Melilla, I will never forget," he says, referring to his passage through the Spanish enclave. The scars on his body are constant reminders of the harrowing memories, he explains, showing the scars on his hand. "I have them everywhere: on my ribs, my legs, my feet." Ngannou decided to speak about his experience today so that "the others will know" - even though he realizes that "when someone is determined, he will leave, no matter what anyone tells him." The Cameroonian experienced in Morocco what thousands of sub-Saharan migrants still suffer today. Between bites of apricot pie, he briefly describes being chased by the police, how his belongings were stolen at Mount Gourougou, how migrant waited to go to Spain hiding in the forest near Melilla as well as the forced returns to Oujda, in northeast Morocco. The boxer hesitated before his first attempt to cross to Spain aboard an inflatable boat. "Since we did not have a paddle, the man who was leading the ship told us to paddle with our hands," he recalls. "I thought to myself: 'There is something off in his head. People die at sea when they have oars, and this guy wants me to paddle with my hands.'" But Ngannou didn't lose hope: "I believed it, I even thought, 'we will go down in history, we will be the first to reach Spain paddling with our hands.'" But the coastguard put a stop to that dream. Ngannou only made it to Spain on his seventh try. After arriving in Tarifa, in the south of Spain, Ngannou spent two months in prison for illegal entry. He was released thanks to the lack of a repatriation agreement between Spain and Cameroon; the boxer then took the opportunity to get on a bus headed for France. "I was hoping to go to Germany or England because boxing is better established in those places than in France, but I wound up here," he explains. Upon his arrival in the French capital in June 2013, Ngannou found his way to a shelter for migrants. He was disillusioned by what he saw. "It was dirty and unsanitary. I thought, 'This is France? This is what we risk our lives for?' It was a shock to me, I did not expect to see that in a country like France," he says. The "Predator" didn’t stay in the shelter, preferring to spend his nights in a parking lot on Avenue Daumesnil, in the 12th arrondissement of Paris. He refused to mix with other migrants and avoided the camps and food distribution points organized by groups supporting migrants. "I went there once but I felt too much negativity and I didn't want to be discouraged. I knew it wouldn't help me move forward and would slow down my momentum. I wasn't here to live a life of misery, but to conquer," the athlete says - with perhaps a hint of pretension. 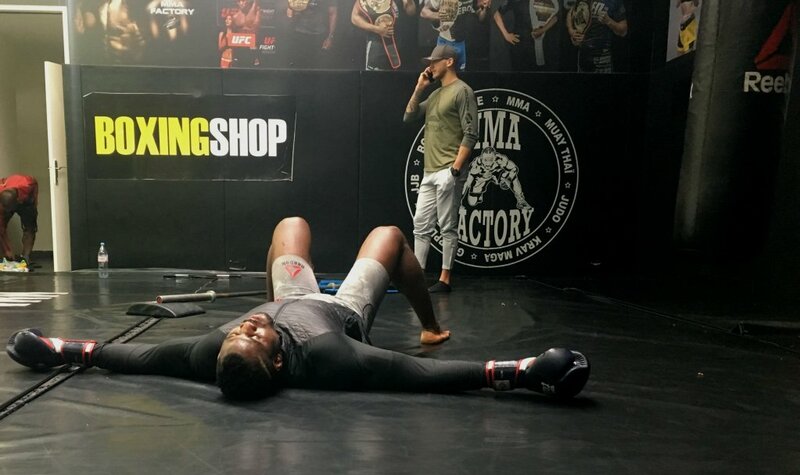 Ngannou had only one idea in his head: to find a boxing gym. The day after his arrival in Paris, he knocked on the door of a local sports hall. The young man met the lynchpin of the club, Didier Carmont, who quickly became his friend. Carmont saw Ngannou's potential and advised him to orient himself toward MMA. Ngannou was unfamiliar with the sport and insisted that he was a boxer, but Carmont insisted. "Didier told me that the world of boxing was too closed and that I would have a better chance in MMA," Ngannou says. 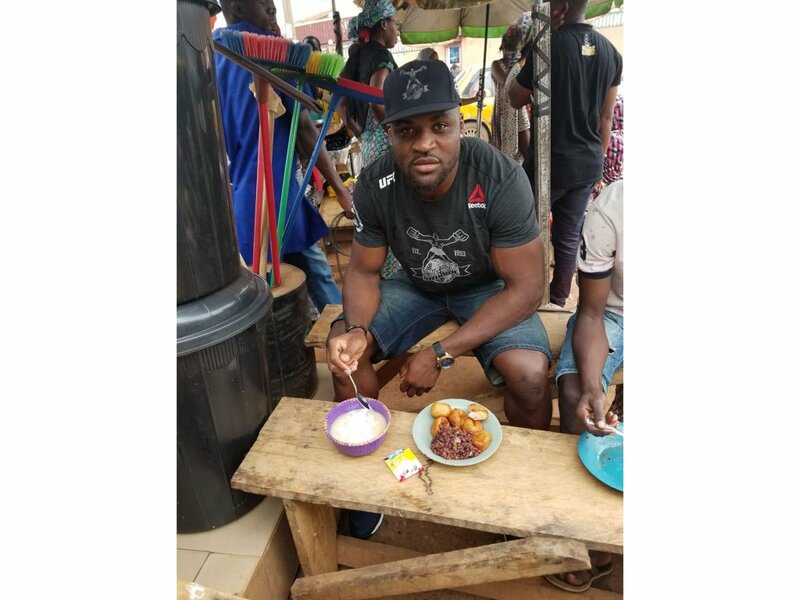 Paradoxically, it is thanks to an association helping migrants that Ngannou first started in MMA: On a summer evening in 2013, volunteers from la Chorba, which distributes meals to undocumented migrants, noticed him while they were patrolling. They offered him food and he offered to work with them. "I was bored all day, I asked them if they were looking for help," he says. "I became a volunteer for them and, during a conversation, I realized that their space was adjacent to an MMA gym!" "When you lose, they spit in your face"
The gym was called "MMA Factory," and was the Mecca of free fighting in France. Fernand Lopez, sports director of the club, remembers his first meeting with Ngannou. "He wanted to train but could not afford to pay the fees. He was already sure of himself and his performance," Lopez says. "I thought he was just a talker like the others. Then I watched him fight and I was impressed." Lopez decided to give Ngannou a chance, training him for free and giving him equipment. Lopez also enrolled him in English classes and organized fights for him. But how could he go abroad? How to could an undocumented person travel? With no administrative solution, Ngannou's first tournaments were confined to France. His reputation was such that some of his opponents preferred to withdraw rather than face him, Lopez says. His almost instant success also helped with his legal situation. In 2015, two years after Ngannou's MMA debut, he signed with the UFC (Ultimate Fighting Championship), the world's largest MMA league. The boxer was given a work visa for the United States. In the process, he also managed to get a temporary residence permit in France. "The first time, I made 2,000 euros for two fights" – which he won by KO and surrender. Soon, his salary reached new heights. Today, Ngannou makes around €100,000 per fight or more. In January 2018, the boxer was paid €440,000 for a loss to former world champion Stipe Miocic. His success went to his head, his coaches said, complaining of his ego and arrogance. "Things went too fast. Francis quickly went from anonymity to notoriety," lamented Lopez, who remains Ngannou's coach. "He had too much self-confidence and it played tricks on him. He doesn't always take my advice, and I think he wasn't ready mentally." But Ngannou says his ego hasn't become inflated: "I'm still the same person I was in Cameroon. It's thanks to my pride that I am where I am now," he says. Always sure of himself, Ngannou confesses that he is rather surprised by negative side of the sport: "They criticize me because I lost my last two games. When you lose, they spit in your face. That's how it is," he sighs. "Unfortunately, that's the flip side of the coin, and I didn't anticipate it." The champion maintains that he hasn't forgotten his roots: "I opened a gym in Batié so that young people can train for free," he says. "I dreamed about it when I was little." He returns to Cameroon regularly, where he is welcomed as a veritable star. It's a boost to his ego: "People visit my mother to take their picture with her," he says. "She has become the queen of the village."